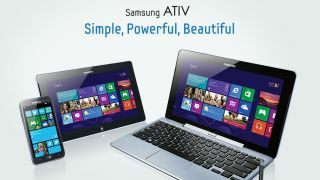 The Samsung Ativ S and Samsung Ativ Tab could both be in stock before the month is out, according to one online retailer. First to touch down in the UK will apparently be the Ativ S smartphone, with Expansys claiming it will receive stock of the Windows Phone 8 device in two days' time - November 21. If you have a hankering for a Windows tablet, then Samsung's offering could be less than two weeks away, with an Ativ Tab release date pegged for November 28. We asked Expansys how sure it was of the dates and a spokesperson told TechRadar: "Those are the dates that have just been given to us by our Samsung distributor - so as sure as we can be." We've already seen the Nokia Lumia 920 and HTC 8X smartphones hit shelves in the UK, with both handsets offering up a different experience to what you find on the iOS and Android handsets also on the market. The Windows 8 tablet market, like its smartphone platform, is still in its early phases with only a handful or tablets currently on sale, most noticeably the Microsoft Surface. We hope to get both devices in soon, so keep an eye out for our in-depth Samsung Ativ S review and Samsung Ativ Tab review.